North Florida Office of Public Guardian | "Everybody Deserves Somebody"
WEDNESDAY, APRIL 10, 2019 FROM 10AM TO 12PM. ALSO, THE INITIAL NEW EXAMINING COMMITTEE MEMBER TRAINING IS ON THE SAME DAY FROM 1PM TO 4PM. Many of you are in need of this training to stay current (if you are up to date with this required training please provide me a copy of your certificate). The Office of Public Guardians will offer this 2 hour training next Wednesday, 4/10/19, from 10 am – 12 pm; cost $50.00. For more information on registration, please contact: MARY CALLAHAN, NORTH FLORIDA OPG, 850-487-4609 X104 or email her at Mary.Callahan@northfloridaopg.org. Hurricane Michael made landfall, crashing into the Florida Panhandle, devastating families and businesses. The hurricane left many people living in desperate conditions. As of Sunday, many customers are still without power, some being the fragile and vulnerable adults who live in the Panama City and surrounding areas. As of now it is predicted that power will not be restored for weeks. We received word Sunday that our office in Panama City, staff and 45 of our clients were deeply affected by Hurricane Michael. The North Florida Office of Public Guardian, Inc. are in need of the following items to be donated to our wards living in the affected area of the panhandle. 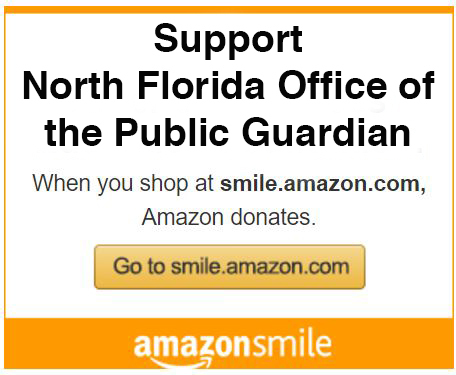 Donations can be dropped off at the North Florida Office of Public Guardian, Inc. 1425 E. Piedmont Drive, Suite 201-B, Tallahassee, FL, or we can schedule a pick up time convenient for you. The Office of Public Guardian, Inc., (OPG) serves adults with mental and/or physical disabilities as their court-appointed legal guardian when they are incapable of managing some or all of their affairs. The Office of Public Guardian, Inc., was established to act as a substitute decision-maker for those persons in the Big Bend Area who are functionally impaired to the extent that they require the protection of court intervention. The OPG provides quality public assistance in the form of guardianship services to vulnerable adults adjudicated incapacitated who have no family, friends, or resources to obtain a private guardian. Guardianship is a serious step! Just because the person has a disability does not mean he or she needs a guardian. Guardianship is inappropriate if there are other alternatives such as a durable power of attorney, medical proxy, public benefits’ representative, etc. You may contact our OPG Staff or click on Referral Process on the toolbar above for more information on guardianship alternatives or information on how to make a referral to OPG.